This vest is one I actually purchased in the fall of 2014 (remember this? or maybe this? ), but I noticed it was created again for this winter! I’m so glad it was too, because it’s proven to be a timeless style. PLUS it just got marked down from $120 to only $70. It’s a winner for those of you who prefer faux to real fur, and in basic black, it looks amazing with anything and everything in your winter wardrobe! 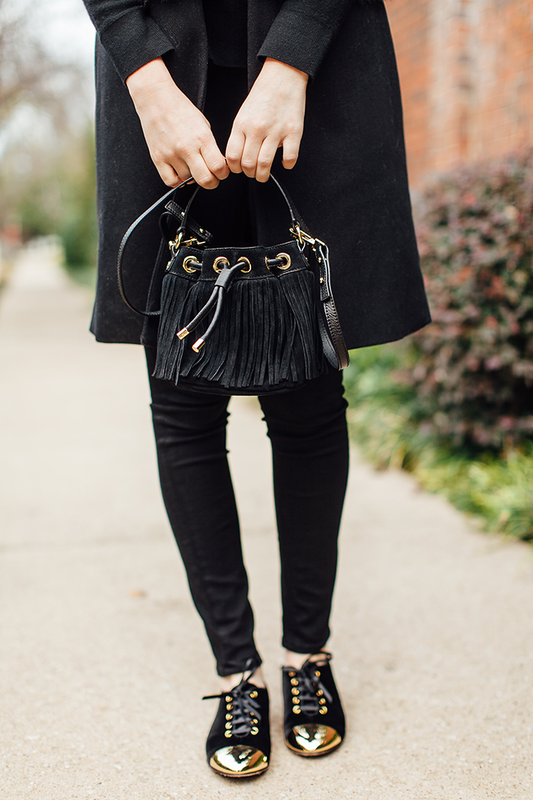 Something new to my closet is this adorable little fringe bucket bag! As you already know, I love fringe and I’m a fan of the bucket bag style – I get both with this cutie. It adds a playful, boho vibe to all my winter outfits. This particular bag comes in leather too, and in a bunch of fun colors! A few of my favorites? Bright pink, bone, and this metallic crackled leather. Click here to check out the entire Milly NY collection! Omgosh cutest little purse ever! Such a chic look. I can’t believe the vest is only $70, it looks so luxe. And that big – amazing! I’m loving those adorable black and gold oxfords! Cute shoes! I love the black and gold color combo. Also your vest is so pretty! Love it! This whole outfit could NOT be cuter! I just love your style so much! I love the shoes! I really like styling an older piece and making it look current. This vest is fantastic! Well done! I love it when a piece I have is recreated for a second year. I always feel so validated in my choices. Loving this all black look. Your new bag is just too good! Black and gold is a beautiful combo! love the vest – the styling is on point ! Great look perfect in every particular. Total black is always the best.